Santiago is an award winning composer committed to create a new layer of narrative for your film or visual media project. Experienced on tailoring music in different tones and colors, adequate for a variety of media genres and styles: From intimate pianos, mellow guitars and subtle chamber music to modern synthesizers, driving percussion and soaring orchestral melodies. From drama, horror, sci-fi and action films, to documentaries, tv advertisements, theater plays and video games. With music in over 20 visual media projects, his experience includes composition to picture, orchestration, mock-up production, music preparation, conducting, recording, mixing, stemming, editing, and sound design. Santiago's main instrument is the guitar and is able to record on similar instruments such as mandolin, charango, ukelele, banjo, bass guitar, etc, and also plays piano and synthesizers. Mainly experienced with suspense, horror, and drama; but has also written pieces for comedy, adventure, animation, sci-fi, documentaries, advertisement, as well as some songwriting. Vast experience on managing small and medium budgets and delivering music on short deadlines. 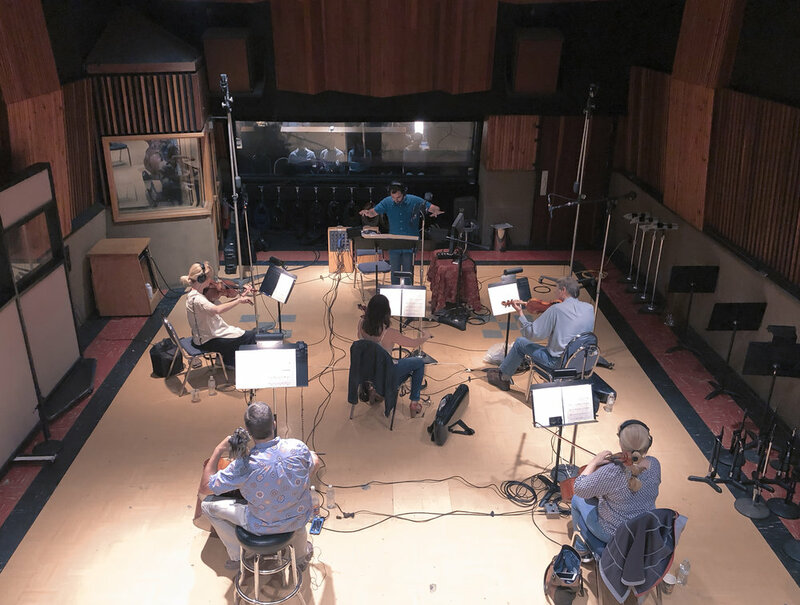 Santiago is enrolled at UCLA's Film Scoring program, being mentored from active professionals such as Jon Kull, Fletcher Beasley, Damon Tedesco, Carl Johnson, Charles Bernstein, and Pete Anthony, among others. He holds a Licentiate in Music Composition from Universidad Nacional de Villa María in Argentina, here he was heavily exposed to Latin American traditional folk music as well as classical European music. He spent three years (2014 - 2016) working as a Film Scoring teaching assistant at Universidad Nacional de Villa María under the tutelage of film composer Claudio Vittore. Over the next year, Santiago will be releasing music for 4 shorts and a feature film in Los Angeles. Currently, he works as an assistant at Velvet Green Music, and collaborates with independent filmmakers in Los Angeles. His latest collaboration with writer/director Dino Sardella for the comedy short film “Killing Adam” is currently in being screened at multiple international film festivals, with already 13 awards and nominations, including Best Original Score at the Mindfield Film Festival, as well as various Best Comedy and Best Picture awards and nominations. Additionally, writes music remotely for Argentina based production company Otro Plan Films, releasing an episode of the web series "Fiction Crew" each month. Their titles “El 5to Orden” and “4” have been selected in multiple international film festivals such as Fake Flesh Film Festival (Canada), 15 Seconds of Horror (Canada), 1000 Gritos (Argentina), Villa María Filma (Argentina), Terror Córdoba (Argentina), and San Mauro Torinese (Italy). “El 5to Orden” won the Best Short Film award at the Villa María Filma film festival, and “4” won the Best Short Film award at the Terror Córdoba film festival. Additionally, he has scored various documentaries such as “Un documental sobre la felicidad”, “Pilsen Rock”, and “Nómades”. For his thesis he scored Michael Haneke’s feature film Caché. The music for strings, piano and synthesizers was recorded by Córdoba’s Metropolitan Orchestra and conducted by Santiago. Also interested on education, he followed his experience as a teaching assistant by teaching composition, music production, and music theory to private students, as well as giving workshops in schools and online. Santiago is constantly seeking for different ways to make orchestral instruments, synthesizers, and popular instruments converge in his music as a medium to convey the underlying narrative and emotion present in the projects he participates in. Feel free to contact him for an original score or to learn more about his current projects.